Who gains from Trump trashing the INF Treaty – Putin and Lockheed Martin! As Trump suspends the 1987 INF Treaty, Putin retaliates. What can be done to prevent a new nuclear arms race from endangering Europe – and the world – again? 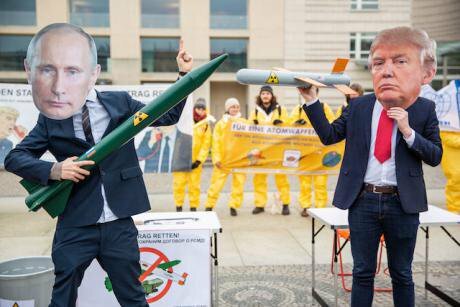 Protest against the dissolution of the INF Treaty by activists outside the American embassy in Berlin, Fb.1, 2019. Omer Messinger/Press Association. All rights reserved. On 1 February the White House announced US "suspension" of the Intermediate-range Nuclear Forces (INF) Treaty, which Presidents Reagan and Gorbachev signed in 1987. A day later Vladimir Putin announced Russia would suspend as well. Freed of the Treaty's restraints, Russia is now posed to deploy a new generation of medium-range nuclear weapons on its territory again. Once again, Donald Trump has played into Putin's hands, to the detriment of US and European security. Unless wiser heads prevail in the next six months, the Putin-Trump team is set to destroy this successful Treaty that halted the US-Soviet arms race, pulled Europe away from the brink of nuclear war, and paved the way for the cold war to end. Trump's excuse for suspending US compliance is Russia's apparent violation of the Treaty with tests on a new ground-launched cruise missile – designated 9M729. Moscow denies that the missile violates the prohibited range of 500-5,500 km, and counter claims that "Aegis Ashore" US missile defences in Romania could be adapted in the future to violate the treaty and threaten Russian cities. There are legitimate security concerns attached to both allegations. And both the US and Russia are worried about China's arsenal of intermediate-range missiles, which are currently exempt from the INF constraints that apply across Europe. Instead of giving Putin what he wants by suspending the Treaty, a sensible US Government would have piled on the pressure diplomatically. If reconvening the Treaty's "Special Verification Commission" is not enough to resolve the problems – which as former Soviet president Mikhail Gorbachev noted in 2017 were more political than technical – there are other constructive ways to address the compliance challenges, rebuild confidence and develop a process to resolve and prevent future problems. If mobile land-based weapons return to Europe... the risks from violent extremists as well as miscalculation, mistakes and accidents would increase exponentially. If mobile land-based weapons return to Europe, as would happen if Donald Trump, his "serial arms control killer" security adviser John Bolton, and Vladimir Putin succeed in trashing the INF Treaty, the risks from violent extremists as well as miscalculation, mistakes and accidents would increase exponentially. Here in Britain we need to remember the Cruise Missiles based at Greenham Common and Molesworth in the 1980s. Authorised by NATO, these were driven by the US Air Force on huge "transporter-erector launchers" around the roads of Berkshire, Wiltshire, Cambridge (and beyond) at dead of night. Billed as "melting into the countryside", these nuclear convoys were in fact highly visible and vulnerable to accidents or attack. With warheads packing the equivalent of 25 Hiroshimas each, they were meant for "first use" and nuclear war fighting in the "European theatre", from the Atlantic to the Urals. The Greenham Common Women's Peace Camp, CND and Cruisewatch argued in the US and British courts that these inhumane and dangerous weapons should be banned. Equipped at most with porridge and paint, these protestors were nonviolent, seeking only to mark and expose the dangerous nuclear convoys on Britain's roads. It is now known that when President Reagan and Gorbachev met in Reykjavik in 1986, they were impelled by the years of public protests in Europe and information from scientists and doctors about the risks and humanitarian consequences of nuclear weapons being used by intent or mistake, including "nuclear winter". They also had been told by then about the miscommunications and miscalculations that nearly turned the 1983 NATO exercise "Able Archer" into a real nuclear war. And both were militarily and fiscally overstretched, though at the time this was a much heavier burden for Gorbachev than Reagan. Is this what Trump and Putin want to go back to? The INF Treaty was a big step forward. One of its major contributions to arms control were the on-site inspections whereby Soviet and American inspectors visited the relevant bases in each other's territory to verify that the silos were emply and the missiles eliminated. These on-site verification inspections were an important confidence-building measure, which was put to good use in several Treaties that followed. Since then, US and Russian arsenals decreased from over 50,000 in 1986 to current levels of just over 13,000, with around 1,000 in the arsenals of the other seven nuclear-armed governments. Still far too many, of course, which is why the United Nations negotiated the multilateral Treaty on the Prohibition of Nuclear Weapons (TPNW), with the aim of drawing all the nuclear-armed and nuclear-free nations into a collective endeavour to stigmatise, ban and eliminate all nuclear weapons. – US military contractors like cruise and ballistic missile makers, Lockheed Martin, are licking their lips at the prospect of even bigger profits from a new arms race. Under the INF Treaty, Russia eliminated some 1,800 missiles and the US eliminated around 800. The disparity is because INF weapons are more useful to Russia than to the United States (at least in theoretical and strategic terms). Giving carte blanche to an accelerated arms race, as Trump is doing, would therefore be more advantageous for Putin than for NATO. The INF range enables Putin to threaten or attack anywhere in Europe. From the US mainland, such missiles could nuke Canada or Mexico; or is Trump planning to deploy them in Alaska to hit Siberia and East Asia? Trump may be hoping to foist a new generation of land-based nuclear missiles on Europe. If so, he needs to be told that this isn't going to happen. The UK and other NATO governments need to make clear that they would refuse to deploy medium range cruise or ballistic missiles in the future, or participate in providing facilities or assistance in redeploying further nuclear weapons in Europe in any form, for any reason. There is already mounting pressure on NATO governments to remove US B61 bombs based in Germany, Turkey, Belgium, Netherlands and Italy, which Washington is trying to update. If the INF Treaty's vital prohibitions on medium range nuclear weapons in Europe are being eroded and threatened, the best security response is to multilateralise and strengthen the prohibitions on all nuclear weapons. Gorbechev has proposed a high level summit between Trump and Putin. Experts in the field argue that the INF Treaty should be expanded to include China and others with missile capabilities. Gorbechev has proposed a high level summit between Trump and Putin. Experts in the field argue that the INF Treaty should be expanded to include China and others with missile capabilities. Recognising that the US, Russia and nuclear-armed counterparts are not yet ready to join the UN's international nuclear prohibition agreements, the UK – as a P5 Member of the Security Council – could at least propose bringing the major nuclear-armed governments together to discuss how to save and expand the INF Treaty prohibitions. Remember US General Eugene Laroque's warning in 1982: "We fought world war one in Europe, we fought world war two in Europe, and if you dummies let us we'll fight world war three in Europe". Time is of the essence to prevent those fears and dangers from taking root again. Unless sensible security leadership is exercised, the INF Treaty could be dead in six months, with disastrous consequences for all of us. Britain and Europe need to play a more active part in preventing the new arms race that is now poised to happen. The first step is to convene the relevant government leaders as a matter of urgency, to examine the evidence and drivers causing the US and Russia to suspend their participation in the INF Treaty, and to take appropriate steps to return them to compliance and reinforce international security and the rule of law.